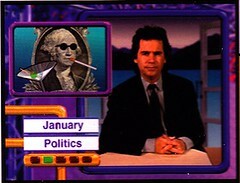 "The punchlines behind the headlines"
‘That’s news to me’ is an assemblage of jokes from celebrity Dennis Miller. Something of a jack of all trades, Miller is best known for his comedy (mostly SNL) but is also an actor (The Net, Murder at 1600) and has been a talking head for both sports (Monday Night Football) and politics (CNBC). This early 3DO release, although interesting, is rather flawed. It’s main appeal will lie with the 3DO collector. The flaws with this game are as follows … well, for one, it’s actually not a game. Not even in the loosest sense, not even close! The control pad is used solely to select which video clips you wish to view. Now granted, I found most of these amusing (if only a few made me chuckle out loud ) but they are very dated. 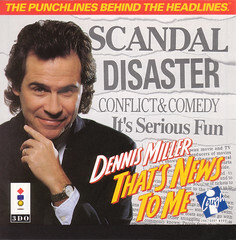 Most depend on knowledge of news events from the year 1993 (It’s worth pointing out also that 3DO fans from across the pond and elsewhere outside the States will likely get even less of this material ) And this is short disc. With just under 200 clips (the packaging says 'over' but this is not true ... I counted) it will only take you approx. an hour or so to view. Replay value ... none to speak of. One viewing should be enough for most. Since he is relatively still throughout it comes as no real shock that the full motion video of Miller is fine. Why is there no fmv of the clips he is describing though? This would have added to the disc. There also seems to be some fluctuation in the lighting which is mildly distracting. Miller's sound bites are clear but once again an added benefit is MIA, this time music. A short track at the main menu and during the closing credits is all there is. Unsurprisingly for a straightforward title, the control is good. It will only take you seconds to learn and is not at all awkward. Hitting the B button will bring up directions though, if for some reason you are clueless. So there we have it ... another 3DO curio representative of the time before the console zeroed in mainly on games. As a collector I am happy to own this fairly rare release ... but only because I am a collector. Last edited by Trev on Mon Feb 27, 2012 2:55 am, edited 1 time in total. I didn't get a lot of the jokes. it's an interesting reflection on the era. Still looks very 80s. Visual humor is better at crossing culture lines. Too bad the multiplayer couldn't have gotten some of the cd-i's Monty Python discs instead. Last edited by Lemmi on Mon Apr 13, 2009 7:23 pm, edited 1 time in total. Agreed. 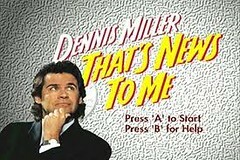 Dennis Miller should stay as far away from professional sports as possible. Unless curling needs a commentator!